For years, many Washington wineries have shied away from screwcaps and other alternative closures. While some, including Hogue, Syncline, Northwest Totem Cellars, and Dusted Valley Vintners have gone all in, others have steered clear or only put their white wines or lower end reds under screwcap. 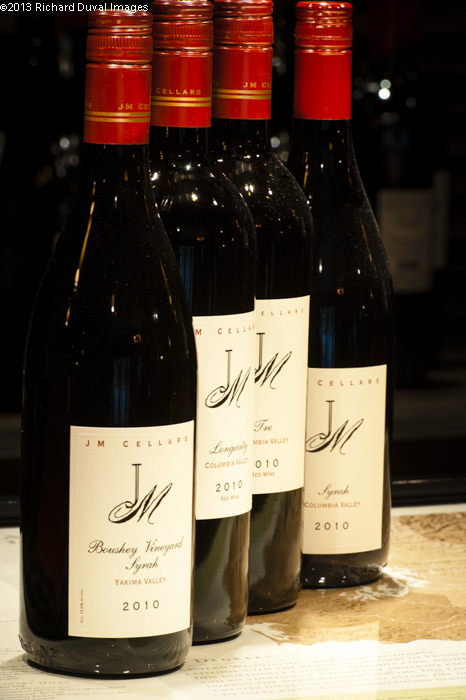 Count winemaker John Bigelow at JM Cellars among the few who have taken the leap. Bigelow first began thinking about using screwcaps after meeting with writer Paul Gregutt back in 2008. After estimating his rate of corked wines at one to three percent, Bigelow was asked by Gregutt if that was an acceptable level. “I told him the answer is definitely, ‘No,” he recalled. Bigelow soon began to consider alternatives. He started out by doing research and talking with people at other wineries already using various alternative closures. One of those people was Corey Braunel at Dusted Valley Vintners. “Corey is a big believer in Stelvin (screwcaps), and he gave me confidence to move forward with our initial use of Stelvin screw tops on our whites three years ago,” Bigelow said. He subsequently added the Bramble Bump Red – the winery’s entry-level red wine - two years ago. For the 2010 vintage, however, Bigelow made an interesting decision for his high-end red wines. He bottled half under screwcap and half under cork and gave his customers visiting the tasting room the choice. What have the results been so far? Bigelow couldn’t have picked a better time to put his wines under screwcap as the 2010 reds reviewed below are nothing if not ageworthy. For Bigelow, the success of his 2010 wines all starts back the vineyard. (Good) An aromatically appealing wine with dark cherry, cinnamon, and toasty oak spices. The palate has firm tannins with a wash of alcohol toward the finish. 58% Merlot, 19% Petit Verdot, 16% Malbec, and 7% Cabernet Franc. Katherine Leone, Margaret’s, Kiona, and Stillwater Creek vineyards. Aged 18 months in French and American oak (70% new). 14.9% alcohol. 675 cases produced. (Good/Excellent) A moderately aromatic wine with high toned spices, cherry, cocoa powder, raspberry, ground herbs, and earth. The palate packs a mouthful of intense, tightly wound fruit flavors with somewhat dry, grippy tannins that still need some time to stretch their legs. Give this one some time in the cellar to see it at its best. 80% Cabernet Sauvignon, 10% Merlot, and 10% Syrah. Klipsun (48%, old vine), Ciel du Cheval (24%), Alder Ridge (14%), Kiona (10%) and Stillwater vineyards. 14.4% alcohol. 425 cases produced. Sample provided by winery. (Excellent) Very closed up at present but opens to reveal a lot of aromatic complexity with cedar, mocha, cherry, herbs, violets, and toasty spices. The palate is bold, dense and packed with rich, layered cherry and herbal flavors with firm but well integrated tannins. Lingers with a chocolate filled finish. Give one to two years or decant. Merlot (40%), Cabernet Sauvignon (37%), Malbec (19%), and Petit Verdot (4%). Stillwater Creek, Alder Ridge, Windrow, and Ciel du Cheval vineyards. Aged 21 months in French oak (70% new). 14.5% alcohol. Sample provided by winery. (Excellent) A brooding, mineral laden wine with peppery spice, smoked meat, blueberry, and floral notes. The palate has bold fruit flavors with firm, grainy tannins and a warm finish. 100% Syrah. Klipsun and Stillwater Creek (80%) vineyards. Aged 18 months in Russian and French oak (50% new). 15.0% alcohol. 225 cases produced. Sample provided by winery. (Excellent) An aromatic wine with earthy funk, mineral, cracked pepper, chocolate, and herbal notes with the fruit dialed back before huckleberry emerges as it opens up. Starts out quite compact but unfurls with soft, sultry fruit flavors. 100% Syrah. Aged 18 months in Russian and French oak (50% new). 14.9% alcohol. 138 cases produced. Sample provided by winery.